So I've been keeping an eye out for books that represent our diversity as I get new ones to review for the LBBC. One of those has been Carmen T. Bernier-Grand's Shake It, Morena! and Other Folklore from Puerto Rico. This book really has been a delight to discover as it shies away from the ubiquitous rhymes found throughout Central and South America. Instead, Bernier-Grand really makes an effort to present the unique folklore found in Puerto Rico. Lulu Delacre goes beyond the text to develop a visual story line that complements and unifies the passages. Her illustrations are beautiful with a softness that is soothing to children and filled with details. And as an added bonus, children will enjoy searching for the 27 lizards hidden in the illustrations. "Everybody has a culture, and we learn the most about that culture as a child. We don’t have culture lessons. It’s just that from the time we wake up in the morning until we go to bed at night, we experience bits and pieces of our culture – while we’re eating, while at school, and especially while we’re having fun. For what is culture if it isn’t stories, games, holidays, food, music, crafts, traditions, religion, language? Shake It, Morena! is a potpourri of songs, riddles, and stories I heard and games I played as a child in Puerto Rico. It covers activities from awakening in the morning, to learning at school, to coming home, to being with the family and then going to bed. 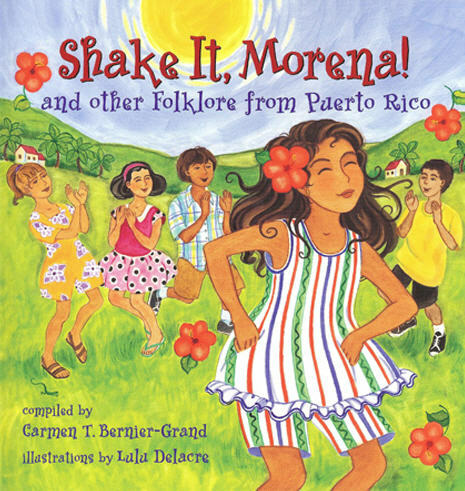 This book is an opportunity to play alongside the children of Puerto Rico, and learn about their culture. It is my hope that educators can use this book to teach Spanish, math (Dos y Dos Son Cuatro), natural science (Puedo o No Puedo), social studies (Playground Passport), reading (The Legend of the Hummingbird), writing (Spelling Game), and physical education (Shake It, Morena!). ¡Diviértansen! (That’s how we say “Have fun!” in Puerto Rico!)" New and gently used copies of this book are available in the LBBC bookshop.